Le Bruit court dans la Ville – André Marchand on guitar, Lisa Ornstein on fiddle, and Norman Miron on accordion – brings together three legends of traditional Québécois music for a feast of outstanding instrumentals and stirring vocals. “Together and separately, they have helped to define Québec folk music for their generation and for the youngsters who have followed them,” says the Huffington Post. 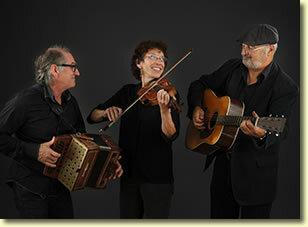 Andre co-founded La Bottine Souriante, the group most responsible for kickstarting Quebec’s folk music revival in the 1970s, and Lisa and Normand joined the group soon afterwards. In 1996, the three collaborated on Le Bruit court dans la Ville, which Sing Out! calls “one of the best albums ever made of traditional Québécois music,” and 18 years later they released Les vents qui ventent, which Sing Out! describes as “a wondrous thing.” Their collaboration is so seamless, each contributing to the larger whole, and the music is so vital and nourishing – it’s like comfort food for the soul. “The combination is amazing,” says Fiddler Magazine. If you like authentic roots music, this is a show you’ve got to see!